Kindle your creativity - Wylie Communications, Inc. I thought the thing I’d love most about my e-reader would be the extra mini-fridge-sized space it leaves in my luggage for necessities like thick Marimekko sweaters and airport-sized Fazer chocolate bars that I collect on my trips. It turns out that my favorite feature is “My clippings,” a tool that transforms my highlights and notes into text that I can transfer to my laptop. After a couple of months of reading on a reader, I decided to review my clippings. What I found will help me — and, I hope, you — model the masters, or steal techniques from some of the year’s best writers to make your own writing more creative and compelling. One problem with modifiers — thin, lean, straight — is that they don’t paint pictures in your readers’ heads. Instead of simply describing your subject with adjectives and adverbs, engage your readers’ senses with analogy. Find yourself writing an adjective or adverb? Could you develop an analogy instead? Can’t find just the right word? Why not make one up? To call attention to an idea, change a word or two in a colloquialism to give it new meaning. Want to call readers’ attention to your point? Surprise and delight your readers with twist of phrase. Regardless of your reading technology, modeling the masters is one of the best ways to improve your writing every day. When you find a passage or phrase or word you wish you’d written, clip it, study and master the technique yourself. 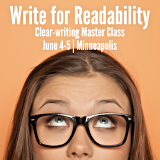 The better your reading, the better your writing. It’s tempting to call metaphor the magic spell in a writer’s repertoire, the Penn and Teller of the page. Metaphor has the power to persuade far better than literal language. It lets you say in five words what would otherwise take five paragraphs to explain. Would you like to master the magic of metaphor? If so, bring Ann in to present Master the Art of Storytelling — a one- to two-day creative-writing workshop — to your team. You'll leave with lots of metaphorical magic tricks.